The participants of this scathing documentary on environmental irresponsibility have high aspirations, using the idealistic powers of the civil court system to take down the mighty corporate giant Ford Motor Company. 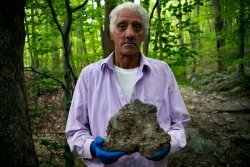 The crime is the heinous negligence of Ford over a 20-year period in the ’60s and ‘70s when the car manufacturer, with wanton disregard for the health of the inhabitants of a small New Jersey reservation, dumped tons of hazardous waste material onto the land. The health ramifications from this are still being felt today. The community of Upper Ringwood is home to the Rampaugh Indians, an insular clan of sorts referred to for decades as backward Appalachia depressed by chronic poverty. Poverty is evident, but this hasn’t zapped the spirit of these people, who in the 8 mm home movie footage are seen as tight-knit, joyous free spirits who cherish the value of family and community. But when Ford bought their land in the ‘60s, they proceeded to use the vacant mines and other derelict ground to dump massive amounts of paint sludge from their plants. Without any care in the world, the kids of Upper Ringwood freely played with this sludge on a daily basis for years, thus exposing them to truly awful and toxic carcinogens, which would decimate their lifespan. Even after the Environmental Protection Agency (EPA) investigation and clean-up, the land is still toxic and dangerous. And now, in the present, a team of idealistic lawyers arrives, led by a sprite Erin Brockovich-type, Vicki Gilliam, to champion the rights of these 'Davids' against the 'Goliath' of Ford. If there is a lead character in this film, it’s Vicki, a sparkplug personality and southern belle/pageant girl-type mixed with a little bit of trailer trash who speaks in aw shucks hyperbole and metaphors. Her gung ho enthusiasm is matched by a palpable naivety to the difficult task at hand. But at the point when we question her credibility, the filmmaker cleverly doubles back to tell Vicki’s own personal story of an inspiring journey from impoverished single mother and high school drop-out to college grad, law school and a career as a lawyer. Directors Chermayeff and Fink make superb use of the 8 mm footage. They show the bygone era as an idyllic American dream world capturing the joy of youth, but also a form of Paradise Lost. The duo find memorable characters in the community, specifically a young man named Mickey DeGroat, who was once a spry, good-looking, strapping lad, but is now broken down from a debilitating skin disease. They also tell the story about the death of a 10-year-old boy from a cancerous tumour in his neck. Unfortunately, there’s also a strong whiff of irresponsible journalism here. Of course, this is a point-of-view documentary, and the filmmakers make it clear that Ford was asked to participate but declined. But at times, the ‘he said’ part of this equation is so grossly exaggerated that the journalistic integrity is threatened. At one point, one of the activists, Bob Spiegel of the Edison Wetlands Association, recounts the details of a story of the bribery of an EPA worker by a Ford Motor Company executive in the back of a limousine only to tell us at the end that this is how the bribery might have happened, in his own mind. That said, there are also a lot of credible journalists, lawyers and scientists who successfully prove their point. The EPA and policy makers of the state of New Jersey and the US Federal Government are featured, which contributes to the high legitimacy of the filmmakers’ endeavour. Despite the confidence and optimism of everyone involved, as the journey progresses we get a sense of a battle being lost – the latest tragedy in the long history of marginalization of these peoples providing a sad ironic historical context to the problems of today. By the end, the documentary effectively hits its mark with poignancy. Mann v. Ford is currently showing on HBO in Canada and the U.S.
You should watch the movie again as some of the points you make miss the mark. Especially about the bribery of the EPA. The point of the story was EPA was likely told what to do not bribed. No one will ever really know because those involved especially Ford and the decision makers from EPA at the time namely Ray Basso refused to be interviewed for this documentary. Thanks Anon for the clarification. but my issue with that scene was how the story was told by the interviewee. Essentially telling a story as if it happened and then telling the audience afterwards that it didn't. That stretched the truth a bit too far for me. That said, the film is still very good.